Palestinians sometimes joke about the fact that, when written in Arabic, "Palestinian National Authority" looks the same as "Palestinian National Salad". And to many here, the PA's handling of Richard Goldstone's UN report on the conflict in Gaza has been mixed up and limp. What began as the publication of a damning report on Israel's military conduct - although it also condemned Hamas - has turned into an embarrassing debacle for Mahmoud Abbas, the Palestinian Authority president and Fatah leader. Palestinians were outraged after the authority last week, under Israeli and US pressure, abruptly halted its drive to speed the report, which accuses both sides of war crimes, to the higher echelons of the mechanisms of international justice. The PA initially urged UN human rights council members to refer the issue to the powerful Security Council which could in theory ask the International Criminal Court to open a war crimes prosecution. But when the day of the vote came, the authority backed deferring discussion until March. 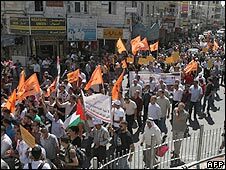 In response, rights groups in the PA's nerve centre of Ramallah took to the streets to denounce the decision. 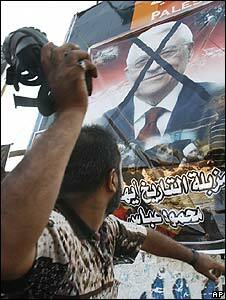 Gazans threw shoes - a sign of disrespect in Arabic culture - at Mr Abbas's portrait on posters that branded him a traitor. Syria cancelled a planned visit by Mr Abbas to Damascus. An Israeli-Arab political party urged him to step down. The authority's damage limitation exercises have done little to help. Some PA figures initially denied a change in policy, while others tried to cast the move as a step to allow more time to build consensus. On Sunday Mr Abbas ordered an "investigation" into how his own government made the decision. On Wednesday one senior figure, Yasser Abed Rabbo, conceded the move was a "mistake". Meanwhile negotiator Saeb Erekat has been threatening to name other countries - hinting that these include Arab governments which would face domestic anger - that he says pressured the Palestinians to back down. Mr Abbas's credibility, which is heavily tied to attempts to negotiate a Palestinian state into existence, had already taken a knock two weeks ago as US attempts to restart peace talks appeared to stall. 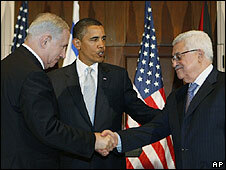 The PA leader faced domestic criticism for participating in a tri-lateral meeting with US President Barack Obama and Israeli Prime Minister Benjamin Netanyahu despite Israel's refusal to halt settlement building in the West Bank. Unofficial reports of the mini-summit, and US talk of Israel "restraining" rather than "freezing" settlement building, left Palestinians deeply disappointed. It seemed that Mr Obama had eased US pressure on Israel. Also, Mr Abbas's Fatah faction's long-running feud with Hamas, and his own conduct during the Israeli operation in Gaza, have come back to haunt him. He angered even some Fatah supporters by being slow to condemn the Israeli offensive which started in December. 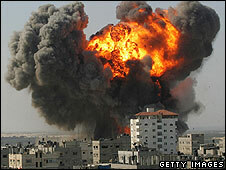 He criticised Hamas rocket attacks on southern Israel, even as Palestinian civilians were dying in Israeli air strikes. According to local media, Israeli Foreign Minister Avigdor Lieberman has said the PA actually "pressured Israel to go all the way" in the operation. There have been reports - albeit from a news agency based in Hamas-controlled Gaza - that Israel threatened to release a video tape showing Palestinian leaders urging Israel to be tougher on Hamas during the Gaza offensive, unless the PA backed down over the Goldstone report. While the tape may not exist at all, the rumours feed into perceptions among some Palestinians that Mr Abbas has at times swung almost traitorously close to Israel in his attempts to defeat his Hamas opponents. Paradoxically, the crisis for Mr Abbas has come amid signs that Fatah and Hamas may be close to a reconciliation deal that has eluded them for so long, that would pave the way for presidential and legislative elections. Mr Abbas's four-year term ended in January, and his authority now rests on disputed legal arguments, rather than a clear expression of voters' views. But Hamas, which won legislative elections in January 2006, will find itself in a similar position from January onwards. Hamas declared the PA's Goldstone decision "a betrayal of the blood of the martyrs", and called for a delay in the planned reconciliation process. But it has not pulled out of talks completely, and one school of thought suggests Hamas leaders may actually be keen to negotiate while Mr Abbas's hand is weakened. Having failed to make progress on lifting Israel's blockade of Gaza, they are currently enjoying a rare moment of triumph boosted by the release last week of 20 female Palestinian prisoners in exchange of footage for the captured soldier Gilad Shalit. The PA move in Geneva has probably not made a major difference to the likelihood of Israel ending up in the dock of the International Criminal Court. This was always low. Even if the Palestinians had persuaded enough countries to vote last Friday to forward the Goldstone report to the UN Security Council, the US and possibly others would most likely have vetoed sending it any further. 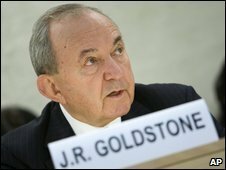 But backing from UN member states would ratchet up pressure on Israel to comply with Mr Goldstone's recommendation that both it and Hamas mount credible, independent investigations into the report's allegations. However, the PA decision's repercussions for Mr Abbas may be wider, especially if Mr Obama's drive to relaunch peace negotiations fails to bear fruit. The weaker Mr Abbas becomes, the less credible any attempted peace process looks - and the less credible any peace process looks, the weaker he becomes.